Nothing quite competes with the perfect sandwich, and in New Mexico you’ll find some of the best traditional options and unique selections in the country. New Mexico’s best delis have mastered the formula required to concoct the ideal sandwich. Whether you’re looking for a hot pastrami, a Philly cheesesteak, or a classic Italian hoagie, any of these New Mexico shops fill the bill! If you’re on a road trip through the state make sure you head south and check out this curiosity of a restaurant. Part museum, part taxidermy shop, part curio shop and, of course, part really restaurant that is so much more than just a deli. Sandwiches on the menu include a French dip, the roadkill rabbit green chili Reuben, cold roast beef hero and a sausage and pepper hero. But there’s also steaks the “size of manhole covers” and ribs, chops and various fish dishes. Local beer served. And just when you thought you’d seen it all, there’s an oxygen bar, too. The pastrami here may come from California, but the rest of the country is well-represented at traditional deli. You’ll find a hot Philly cheese steak, a grilled New York corned beef and a southwest inspired border dog, bacon wrapped quarter-pound hot dog with grilled onions and jalapenos served on a fresh hoagie roll. In true deli-style you can buy pastrami and corned beef by the pound. Burgers, burritos, tacos, breakfast sandwiches round out the choices. Don’t leave without trying the pastrami fries—seasoned fries topped with the house chili con carne, cheddar jack cheese and a quarter-pound of pastrami. Online ordering and pick-up available. This is a true New York deli steeped in family traditions that were honed on the lower east side of Manhattan. That knowledge is at the core of this deli’s menu. You’ll find classic sandwiches like chopped chicken liver, hot corned beef, hot pastrami, genoa sa-lami and provolone, plus whitefish and tuna fish, as well as egg salad and chicken salad. It wouldn’t be a New York deli without matzo ball soup … on the menu! Check out other options like burgers, salads, fish dishes and, of course, bagels. Open for breakfast and lunch. For a quarter of a century, this quaint restaurant in the picturesque town of Taos has been a favorite with locals and tourists. Everything is made-from-scratch from the green and red chili to the huevos rancheros and eggs benedict, as well as the mouth-watering sandwiches, fresh baked good and homemade soups and stews. A deli wouldn’t be a deli without a Rueben sandwich and this one is one of the best. Vegetarians and vegans are treated to homemade hummus and baba ghanoush plus a whole lot more. Comfort food just right for relaxing and enjoying. The sub, a true Italian sandwich, is named that because of the shape of the roll on which it’s made and the meat and cheese that’s layered into it. Tully’s, true to its roots, makes traditional sub sandwiches and has been since 1970—many of which are named after famous Italians. Last year, it was named “Best Deli” in Albuquerque’s “Best of the City” awards, in large part due to their house-made New York-style sausages and Sicilian-style marinara sauce, as well as the wide-ranging selection of Italian groceries, Boar’s Head meats and cheeses, imported olive oil, pasta and aged Balsamic vinegar. Don’t leave without some Italian cookies. Giant spuds. That’s something worth stopping for! Choose one of their concoctions topped with meat and cheese and all sorts of veggies, or build one of your own. Sand-wiches are all about the club—grilled chicken, orange cranberry, black angus or veggie. Of course, there’s soups, salads and an assortment of sides. Wash it all down with a glass of their famous sweet tea. Dine-in, take-out and catering available. 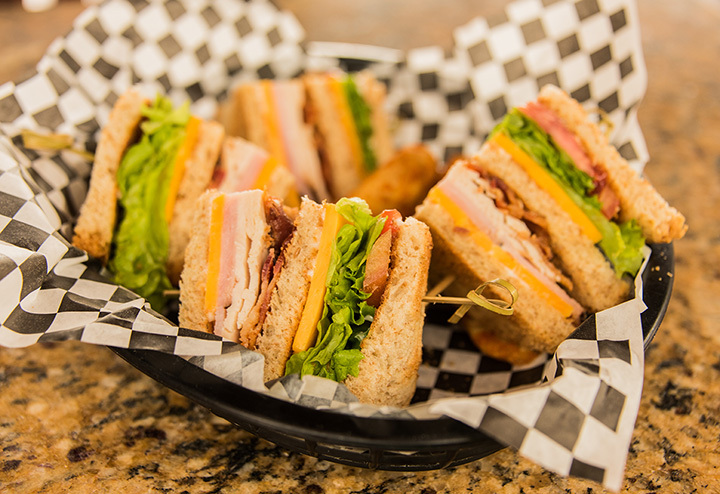 More than two dozen hand-crafted sandwiches with the freshest ingredients are the hub of what this deli offers. It wouldn’t be the southwest without some spiciness so try the green chile chicken club or the jalapeno steak sub on the original French roll (they have a whole wheat option, too.) Build-your-own sandwich for just the taste you want. They proudly serve Boar’s Head meat and cheeses. Fountain drinks, Italian sodas and a variety of iced teas available. Of note: There’s a pickle bar! In the heyday of Route 66 travel, the town was a popular stop for cross country travelers. That hasn’t changed with the passage of time or the building of Interstate 40. There’s still plenty of activity and Cornerstone Deli is in the heat of it, right smack-dab on old Route 66 in downtown. The menu if chockfull of both custom and specialty sandwiches, salads, hamburgers and sides, like chile cheese fries or tots, frito chile pie and onion rings. Deli meats are fresh-slices and run the gamut from pastrami to roast beef to ham, turkey and salami. Get your southwest flavor fix with a New Mexico green chile dog or house-made red chili. Top everything off with a malt, shake or ice cream cone. An authentic Polish and German food deli and restaurant in the middle of the New Mexican desert. Who’d have guessed? This family-owned and operated eatery is the real deal—six different types of heavenly pierogis, polish sausage, cabbage rolls, beer brats, sauerkraut and even gyros. On the menu are also sandwiches like the Italian beef, original Vienna beef brand with gravy, cheese, hot or sweet peppers on French Bread. Don’t drive by this converted gas station without stopping in for the perfect Polish Dog.